I hope you all had a wonderful weekend! 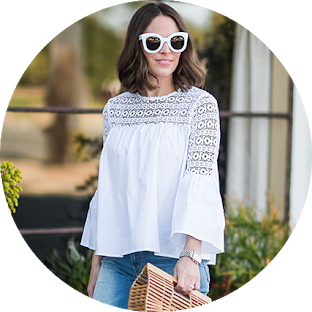 In celebration of Mother’s Day, I wanted to put together a little gift guide to help you if you need to get a unique gift for an expectant or new Mom in your life! Being pregnant with my second baby and having tons of friends who have been through having a new baby at home, I feel like I can speak confidently on this topic and help you out! 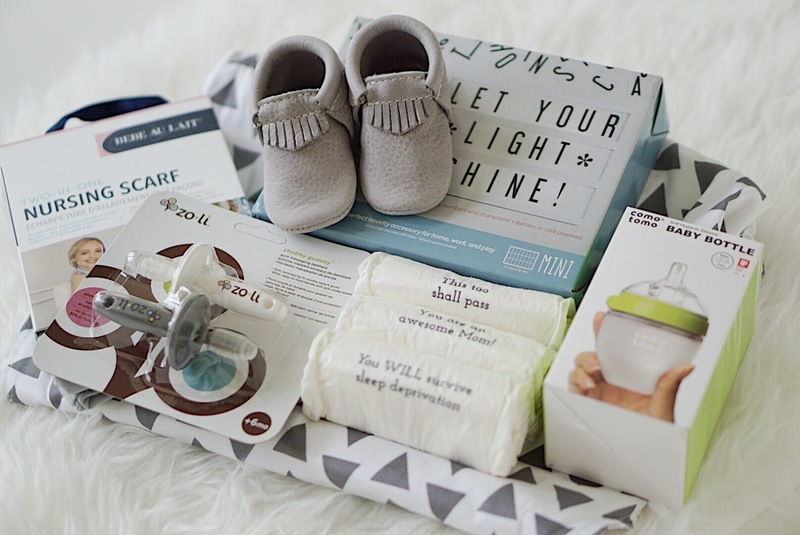 When I’m shopping for the perfect shower gift or gift for a new Mom, I always like to either go off their registry or select something I’ve personally loved and used with Coco. Personally, I’m ALWAYS tapping my Mom girlfriends for advice on what to buy, and I’m pretty sure we can all vouch for these goodies! 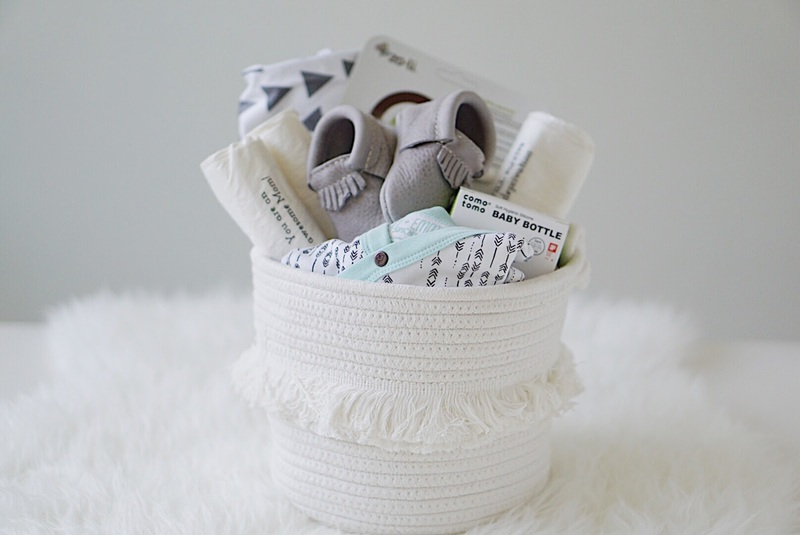 Not to mention the fact that I love creating gift baskets (like the one above) to give as a gift and some of these ideas are ideal for that because they’re smaller in size and budget! 1.) Freshly Picked Moccasins: First seen on Mason Kardashian and Shark Tank…but that’s besides the point. I was gifted these for Coco at my shower (in rose gold…insert heart eye emoji here) and ended up purchasing more pairs than I’d like to admit thereafter…like these which will be handed down to this little baby boy and in my opinion are a great unisex option! And don’t even get me started on these. Coco didn’t walk until 16.5 months so these were a comfy shoe for her to crawl around in and are ideal for new walkers because they’re kind of like being bare foot. 2.) Como Tomo Bottles: Let me begin by saying that Coco took a total of one bottle her entire life. Yes, you read that correctly. And the one bottle she took was a Como Tomo that was handed down to me from a girlfriend. When I tell you that I tried every brand to no avail, please just trust me. I should clarify that myself, Austin, my Mom, my girlfriends, my MIL and an occupational therapist tried them all to no avail. Coco was determined she would not take a bottle (or paci) and boy did she stick to her guns. When an occupational therapist tries for a week (unsuccessfully) and says, “you’ve got a toughie!”, you know you’re in trouble. But how impressive is it that Como Tomo was successful on the first try?! I’ve had many girlfriends tell me that this was the only bottle that worked for their babies but regardless, all Mom’s end up going through a trial and error to find the right fit for their little one. Bottles are something she may not have registered for but something that may come in handy during a late and desperate night of trying to get a baby to take a bottle. 3.) Light Box or Letter Board: Because everyone needs a really cute way to document and photograph the ‘week’ that their baby is on! How cute is this example via Pinterest? 4.) Teethers: Another thing that no doubt, will be forgotten on the registry. I can assure you however that any new parent will appreciate having one on hand for when the dreaded teething Season begins (which can start around 3 months!). Coco’s favorites were these, these and I couldn’t buy enough of these. 5.) 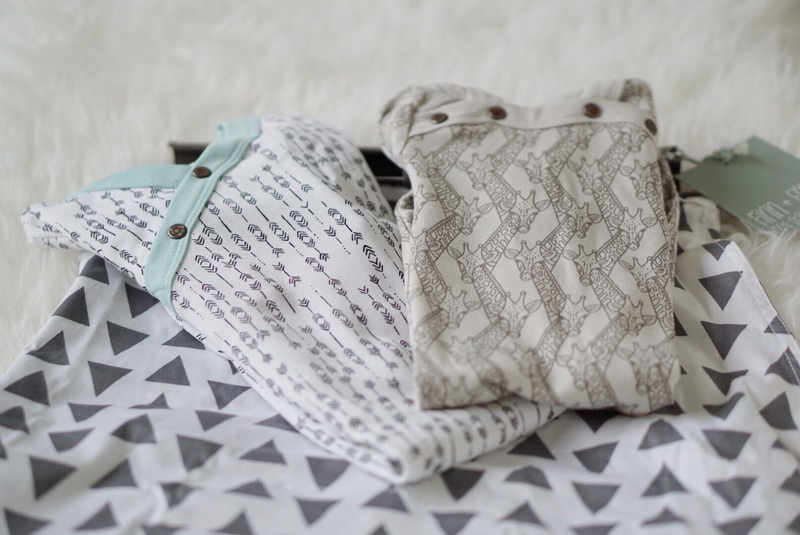 Diapers: You can never have enough diapers but these Coobella diapers are something really special and are an amazing and unique gift to give. Each gift box comes with 20 customized bamboo diapers each with funny saying or message like my personal favorite, “You will survive sleep deprivation”. The essence of Coobella is to give Mom’s what they need most: diapers (obviously) with an added touch of inspiration, grace and laughter because life is changing…literally! And what new Mom couldn’t use a little laughter after a blow out? 6.) Shopping Cart Hammock: This is something my girlfriends rave about that I’m so excited to try when we have our baby! Nothing stressed me out more than the idea of grocery shopping with a newborn! My car seat weighed a ton and where exactly was it supposed to go? The back of the cart? Then where did the groceries go? Insert this genius invention that you can use with or without a carseat! It holds up to 50lbs (wow), is safety tested and can be used for babies up to 6-8 months. And obviously when they sit up, this is a must have because #germs. 7.) Unique Clothes: I know what you’re thinking…you don’t want to buy clothes as a gift because everyone will do that. Well scratch that thought because I LOVED getting clothes and accessories for Coco. Especially if they were from unique brands that I hadn’t heard of (which as a first time Mom, I was clueless about baby clothes). Nothing gets me more excited than getting introduced to a brand which then becomes what I would call an all out unhealthy obsession (I’m looking at you and your pajamas, Hanna Anderson). Since getting pregnant with this little guy, I’ve received some precious clothing from brands of which I know I’ll get addicted to. One of those is Finn and Emma. 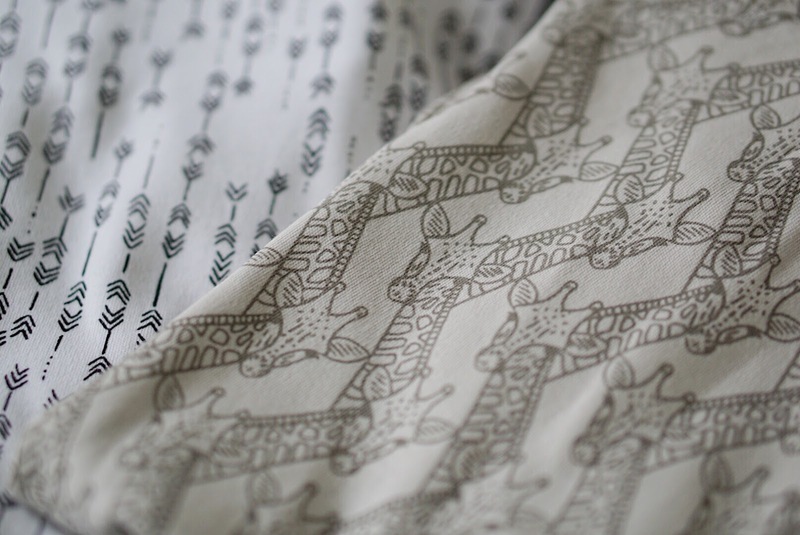 They’re a brand that balances style and sustainability as their products are made with eco-friendly materials using fair trade labor practices which is pretty hard to find. 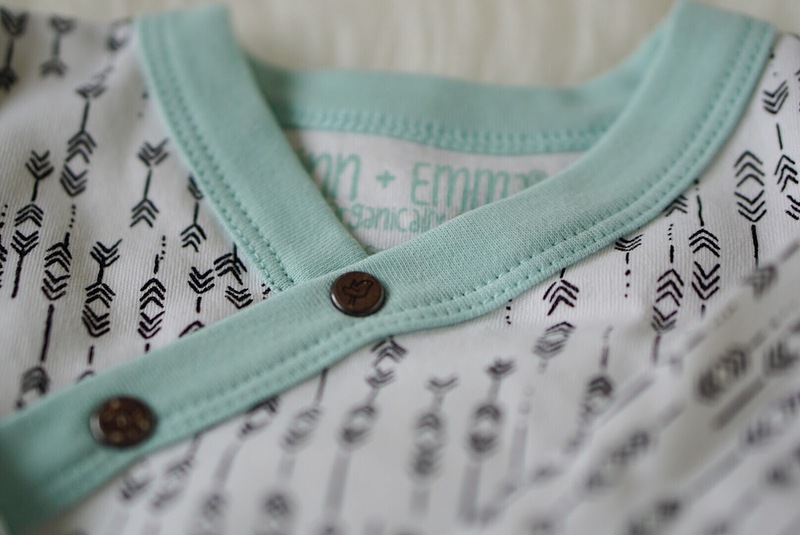 Not only are their designs darling- love this and this, but the material is some of the softest I’ve ever felt- probably because their garments are certified organic and made with non-toxic dyes…#signmeup. 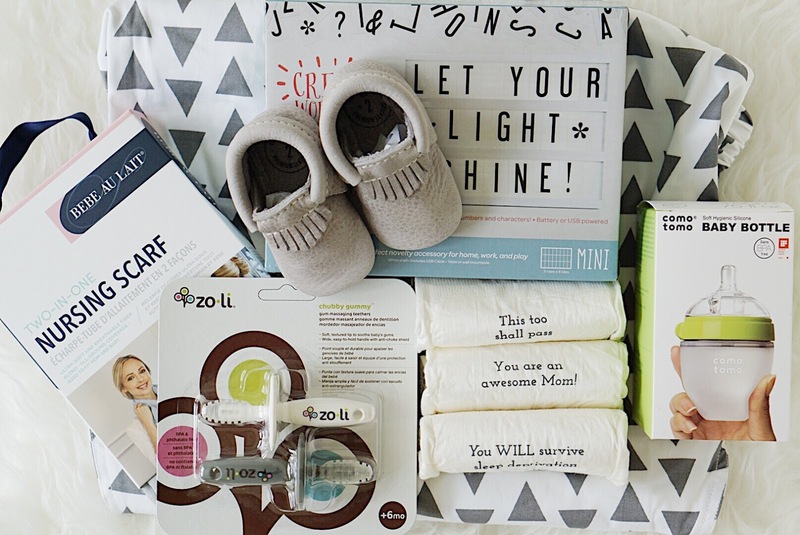 What are your favorite items to gift a new or expectant Mom? I’d love to hear! As always, thank you so much for following along! *this post was sponsored by several brands mentioned above however all opinions are my own!